I don’t have words to describe my year at LSE. One post is not going to do justice to everything that I learned, to all the people I met and to how much this year has changed me. However, after months thinking about data E-V-E-R-Y S-I-N-G-L-E D-A-Y, there is no better place to start. By surrounding ourselves with technology, we produce data as by-products of our every move. According to Deborah Lupton (2016), “lively data” is generated from our bodies as a result of sensors embedded in smartphones, tablets, smartwatches etc. This data is then fed back to us through applications and interfaces that shape our perception of the world as our lives become progressively more mediated. At this point, I ask; Is our data a plausible representation of us, or is it something else? A work of art? Is it just a picture of a single moment in time, detached from context? Or does it have a purpose? David Beer (2016), defends that data creates things and changes the social environment through which it circulates as we make decisions and model our behaviours based on it. One of the most striking features of my London life is that I get lost. Often. Therefore Google Maps easily became my best London friend and my last resort to understand this city. 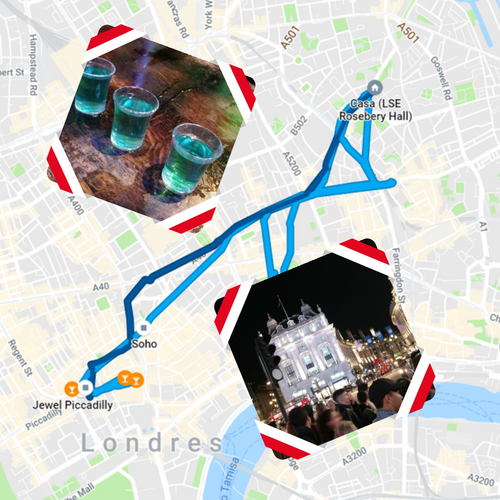 As we have roamed the streets of this city together, it wasn’t much of a surprise when I realized that by going back through my Google Maps Timeline I was able to relive everything once again. But is that really me? Some of it has been condensed in a blur, such as when I went hiking in Richmond with my sister and father and was outside Google’s reach. But some of it is really clear, it shows the indecisions, the faux turns. And as I attach it to Google Photos, it is as if I was there all over again. And, boy! I did take pictures. The most random moments, which later proved to be so relevant to me in the long run, were all caught on camera. 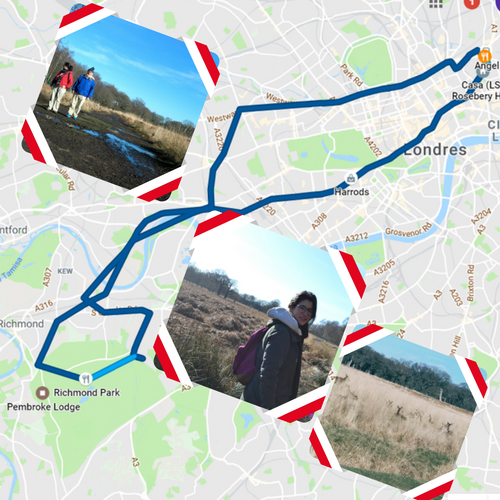 Sorry Google, you simply don’t do justice to the beauty and size of Richmond Park. I went there with my sister and my father when they came to visit in February, we spent a chilly winter day walking through the fields and it was easily one of the most beautiful places I have been to. It was mid-Easter break when I decided to take a train to somewhere in the middle of England. Let’s go for an adventure, I thought. 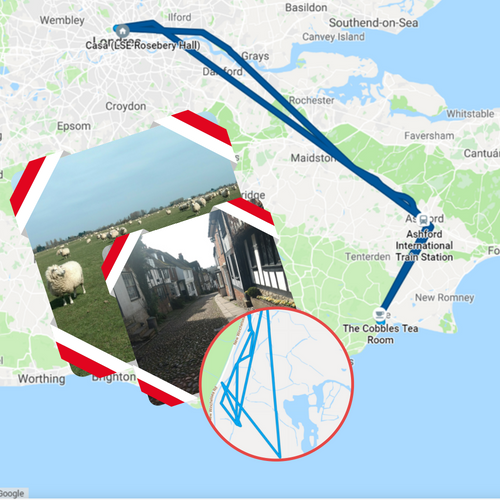 I ended up walking among sheep and eating incredible scones in Rye, East Sussex. After several weeks of focusing on my essays, it felt good to get out just for a little bit and explore the unknown. From the map, you can see that I took the train all the way to the coast, although Rye has long ceased to be a coastal city. If you zoom in, it is possible to see the moment I left the city centre and trespassed through a farm to walk the 2 km towards the ruins of Camber Castle. Quite an adventure! One of the best things about moving here was having the chance of meeting up with family members who are living in Cambridge. It had been a long time since I had last seen my cousins and it has been great being with them and getting to know the new generation a little bit better. In early May my mother came for a visit and we spent a sunny Saturday there doing punting and picnicking. The “winter experience” was quite new for me, and I cannot deny that I was impressed. I had always dreamt of seeing snow, but the best part was experiencing it alongside these incredible people. I will never EVER forget it. Here we are in February 28th doing our best Beast from the East impersonations. Once again Google Maps outdid itself. If you zoom in, it is possible to see quite clearly when Sahana and I went to the square next to Rosebery to play in the snow and take the first pictures while we waited for Paula. 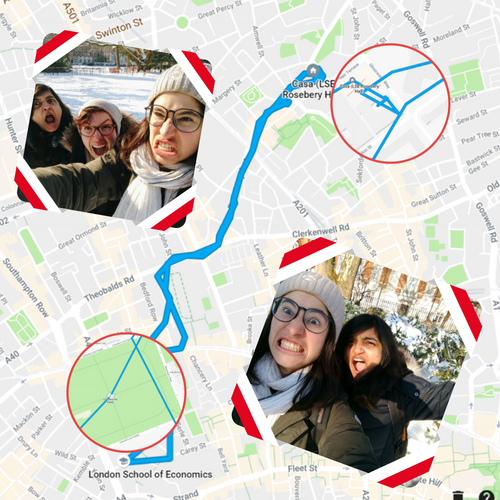 Then you see us walking through Lincoln’s Inn Fields, where the second photo shoot took place, together with the failed attempts of building snow angels. PS: Some will argue that my Ronaldinho impersonation is even better than my Beast from the East. Lumiere London was an exposition that took over landmarks of the city creating urban interventions using light effects. 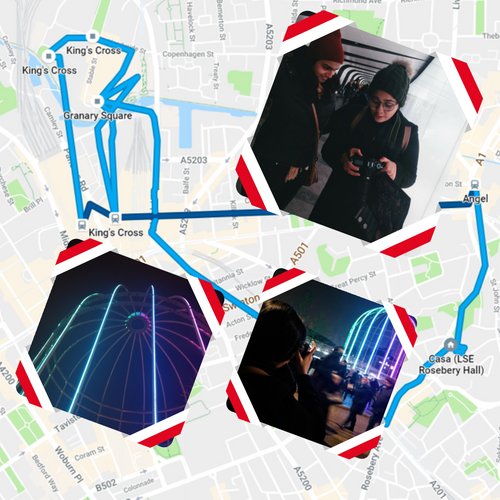 Sahana, Divyakshi and I spent a January evening (almost freezing) walking through King’s Cross. 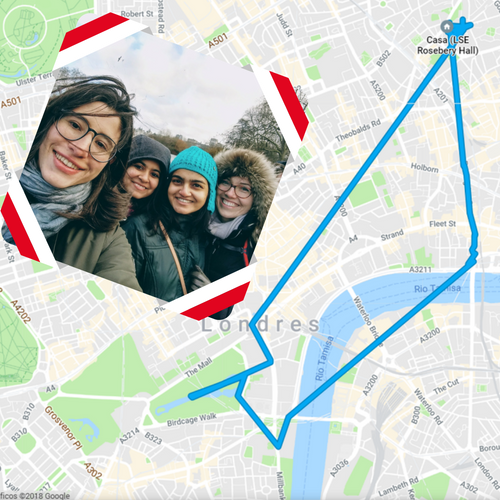 If you look closely, you can even notice that we took the bus from the wrong stop and walked unnecessarily, as usual :). One would expect that by mid-April we already knew how to walk back home without getting lost since we do that every single day. Right? Well, not exactly. 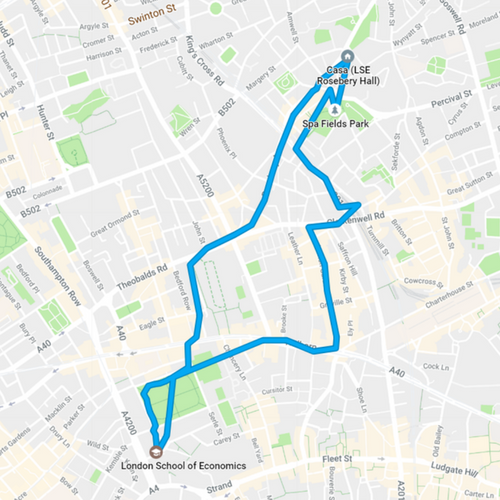 This is the path that my friend made me take on 21st of April. He was completely lost and Google Maps can prove it! Receiving visits was an important way of letting myself get out of LSE for a little bit. 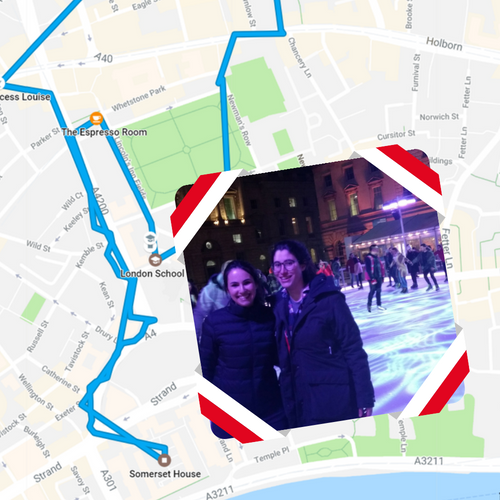 In November my friend Violeta stopped by for a little bit and we did something I’ve always wanted to do: ice skating in Somerset House. Back to the chilly mornings, it was early January when we decided to go for a tour of royal places in London. Cool right? Except that my friends and I seem to really have the tendency to nearly freeze. 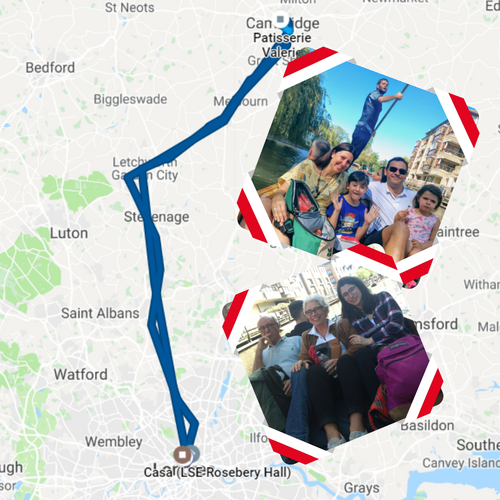 The tour was pretty cool though, Google Maps did fail for a little bit, not only in getting us to Waterloo station in time but also in keeping track of where we were, so you cannot see it clearly. It started in Waterloo, went through Parliament, Downing Street, showed us where they killed King Charles II and finished at Trafalgar Square. This was one of the happiest days I had in London. I don’t think that I have ever felt that much joy. 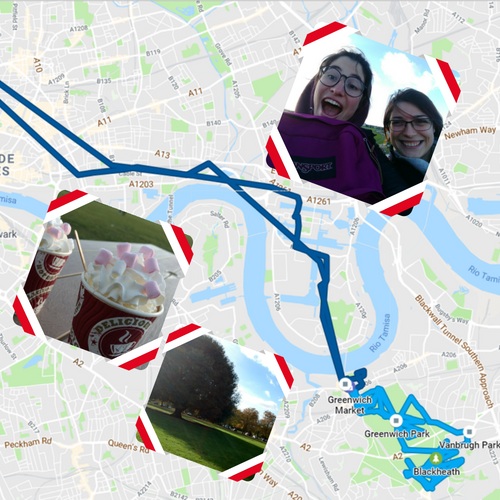 It was late October when I met my friend Nina in Greenwich, we spent the day walking – and you can see on the map that we walked a lot. We got lost and ended up in this carnival-style park where we had hot chocolate and went on the Ferris wheel – which I thought was named a merry-go-round. We are now drawing closer to the beginning. This was the first time I met my friends from the Data & Society programme. It was also the first time that I got on a double-decker bus – I remember that Annalisa had to teach me how to do that. 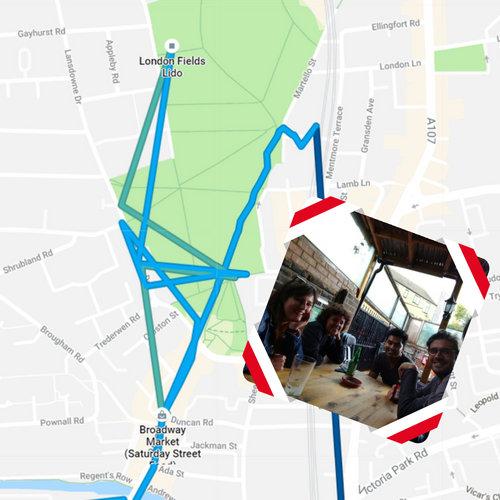 We went for a picnic in London Fields, close to Broadway Market, but were interrupted by the rain – it is London after all – and we ended up in a pub. Another fond memory, this was during Welcome Week. My friends and I went for a pub crawl with these weird blue drinks. We can see on the map the exact clubs they took us to. Not quite a pub crawl, I must say, more of a club crawl. Google Maps really can capture the little indecisions in your moves. I remember on September 6th, my second day in London, when I went to LSE for the first time. I got lost in the junction between Clerkenwell Avenue, Rosebery Avenue and Theobalds Road. I walked in circles for a while and asked someone for help. I then got lost again and ended up in Lincoln’s Inn Fields. I managed to find LSE when I was able to locate the 32 Lincoln’s Inn building and took a picture that I immediately sent to my family “I am here, finally!” the joys of technology. The result is this sort of zigzag path you can see on the map. I then moved on to try and get to Regent’s Street but got lost in the process again. Last, but not least, this is the picture that gave birth to the idea for this post. I got to London before everyone else and I was able to join the pre-Welcome Week events. 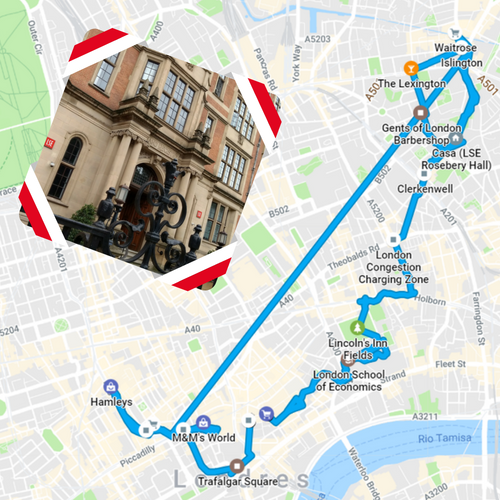 The most memorable of them was the Local History Tour, which was led by Tim, a very funny man who took us to the place that inspired Sweeney Todd, walked us through Lincoln’s Inn and past a talking statue. If you ask me today, I have no idea where the Sweeney Todd Alley is. Or the talking statue – although now that I see it on the map I might. But something else happened on this day. During the tour, I met two incredible people: Rebecca and Manuel. Rebecca is an Environmental Policy and Regulation master’s student while Manuel is in the LLM. The magical thing about this story is that, as happened with so many people I met during Welcome Week, we could have never spoken again. 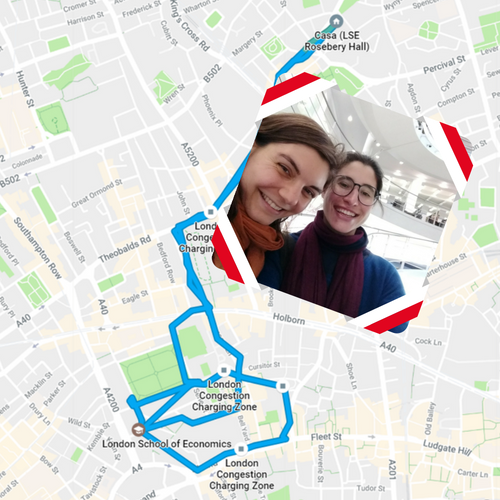 But we did, we continued to have lunch together sporadically and throughout summer term Rebecca and I took up Pilates at the LSE SU. I guess good friendships come from the most unusual interactions. The picture here is from me and Rebecca in the first time we met when we decided to explore the Library together. If you got to the end of this post with me, I hope you enjoyed reading it as much as I enjoyed remembering all these little moments. It is indeed creepy to think that Google actually knows all these things about you. I should delete it all. But maybe I won’t, just because I might want to know where the talking statue is when I look back at that day in a few years. If you want to know how much data Google maps actually knows, go to your own timeline, click on the engine on the bottom right corner of the screen and select “Download a copy of all your data”. Unfortunately, it doesn’t come in a very accessible format. But it is yours, you might want to own it. Wishva is an undergrad student who is also living in Rosebery and had a similar idea, which he posted on his personal blog. Beer, D. (2016). Metric Power. London: Palgrave Macmillan Staff.